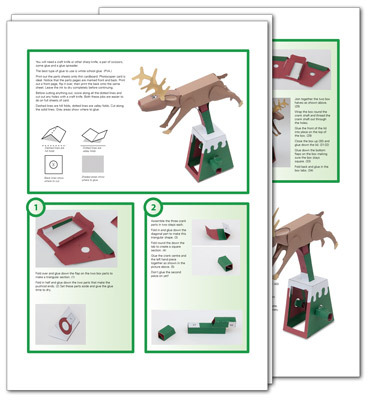 Finished the instructions for the reindeer model – I reckon it should be up on the website on Wednesday at the latest. I need to do the web pages and finish packaging the uploads. I've just discovered a tick on the cat's neck,. Yuck. I've been reading various web pages on how to remove them without exploding the tick or causing hideous diseases in the cat. My true love, is, of course, not up for this job. I reckon if I treat it as a scientific excercise I can look at it dispassionately and hence not throw up. I'm off to find the cat then I think I'll have earned a glass of red! Tick photos here if you are interested!